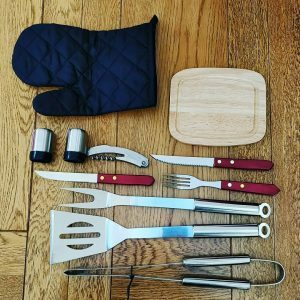 The Romanticist 12 piece set aims to give you everything you could need to accompany a BBQ, at home or when out and about. The set comes in a red(ish) bag that looks like something you’d find in the back of an ambulance. The bag has two storage areas, a front area that contains the BBQ tools and a 15.5″×10″×8.5″ cooler bag. The tools are dishwasher safe and it’s a good range packed away in a portable bag making them great for portable BBQs and makes them easy to store away when not in use. While it’s a great set there is room for improvement. With so many tools it can be a bit of a brain teasing puzzle to figure out how to pack them away when not in use. This could’ve been solved by a simple white outline of the item in the position it’s meant to be stored. Another issue is that the sale and pepper shakers haven’t been designed for travel, they’ve got the same holes in the top you’d find in a home set and this means you could end up with salt/pepper all over the inside of your tool section. Finally the included strap is very thin and means the bag isn’t comfortable to carry if you’ve got additional items (such as drinks) in the cooler bag. However, balance that against the low cost and you’re getting a useful set of BBQ utensils in an easy to store bag for not a massive amount of money.